The landscape was full of machines and scrap metal connected to the facility in one way or another. Always present on the horizon were the colossal cooling towers, with their green obstruction lights. If you put your ear to the ground, you could hear the heartbeat of the Loop – the purring of the Gravitron, the central piece of engineering magic that was the focus of the Loop’s experiments. The facility was the largest of its kind in the world, and it was said that its forces could bend space-time itself. In the town near the Loop, a group of kids find themselves embroiled in a mystery about a product launch of a new line of action toys.It seems the weirdness from the Loop is leaking out! Oh man first Magical Fury and Now Tale from the Loop! This Summer is going to be great for listening. Not seen this rpg before. Robots and…? @Aston: Robots and kids. In the 70’s/80’s. The magical ET/Stranger Things version of the 80’s. Amazon is making a drama series called ‘Tales From the Loop’. The same inspiration? 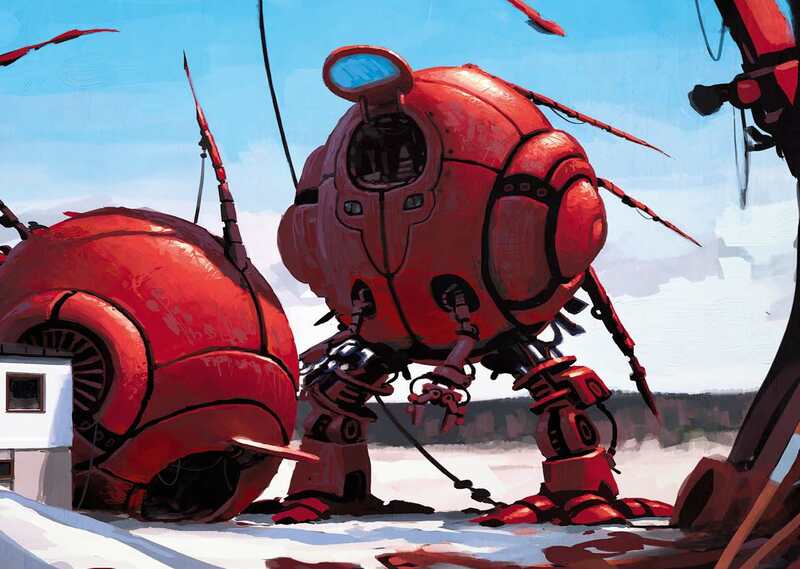 Art from the creator of the rpg. An adventure rooted in some serious nostalgia for 80s kids and of course right up Aaron’s alley. Loved the accents of Shaun’s sassy pessimistic delinquent contrasted with Renee’s optimistic folksy character. Ross did a great job with all his robot interjections (‘FRIENDS!’) and playing the lovable but absent parents. agreed, Shaun and Renee really played off of each other well.